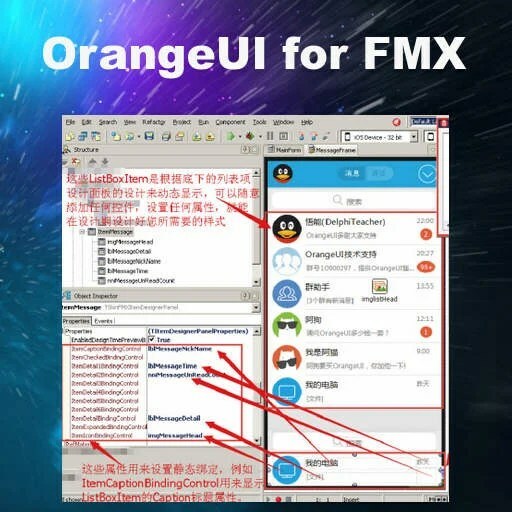 Developer DelphiTeacher out of China has released a new version of his OrangeUI component suite for Delphi XE8 Firemonkey. OrangeUI is a huge set of custom components for Firemonkey that are optimized for the Android, IOS, OSX, and Windows platforms. Some of the components that are available in the component suite are Button, CheckBox, DrawPael, Edit, Image, ImageListViewer, Label, ListBox, ListView, Memo, NotifyNumberIcon, PageControl, Panel, ProgressBar, PullLoadPanel, RadioButton, ScrollBar, ScrollControl, TrackBar, and maybe as many as 100 total controls. A lot of the information about the component suite is in Chinese but you can easily translate that. It looks like the main purpose of the OrangeUI component suite is to create a more dynamic and media rich set of controls for Firemonkey (and maybe even better Chinese character support). A lot of the screenshots show all kinds of graphics integrated into the various controls. Some of the documentation also talks about a custom smooth scrolling TabControl. There is a large media image available with tons of screenshots showing the different controls. There is also a huge number of demos available showing off all of the various controls (check out the OrangeProjectCommon directory for some useful Firemonkey code). This is a commercial component suite (and it is pretty expensive for the source code version) but there is a free trial available. It appears that the only way to purchase the suite is to contact the author directly. I’m not sure if this component suite trial will work with Appmethod (though the source code version probably will). Head over and check out a full blog post about the OrangeUI component suite and then download the free trial. Update: Official OrangeUI blog is here and official site is here.